Illustration of displaced left turn at Ga. highways 54-74. Peachtree City graphic. Big changes are coming to Peachtree City’s biggest daily traffic jam. It’s called a displaced left-turn intersection, and it will change the way you make left turns going north and south on Ga. Highway 74 at its junction with Ga. Highway 54 when it’s finished sometime in 2023. When the traffic lights turn green for traffic on Hwy. 74 to go north and south, left-turning traffic will be given the green light to go at the same time. Only left turns from Hwy. 74 will be affected. Left turns from Hwy. 54 onto Hwy. 74 will stay the same. To make that happen, the north-south left turn lanes will be repositioned farther back from the intersection. Traffic making left turns will actually cross the opposite lanes. “The continuous flow intersection moves the left-turn conflict out of the intersection and synchronizes it with the signal cycle of the intersecting road,” according to Wikipedia. A DLT at this location will streamline the current eight-phase signal operation to a five-phase process by eliminating the phases needed for the north-south left turns. Upon project completion, the crossovers for the left turns will be relocated approximately 500 feet north and south upstream of the main intersection, allowing left turns to run simultaneously with the north/south through movements. The reduction in traffic signal phases will allow for the decrease in cycle lengths along Hwy. 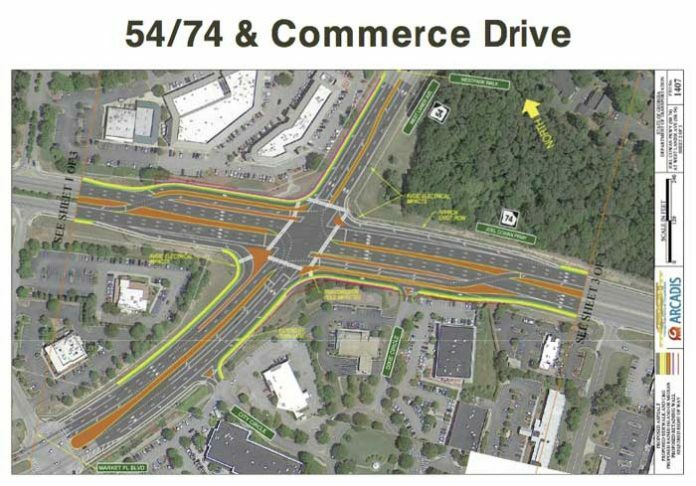 54, which will also improve the efficiency of the other intersections east and west of Hwy. 74, according to the designer. “With extensive experience in the design and implementation of such DLT projects, we are confident we can provide GDOT and the community with the best alternative to reduce congestion and increase safety along this central corridor,” Keith Strickland, PE, Stantec project manager, said. The Georgia Department of Transportation has selected Stantec, a global design and engineering firm with three offices in Georgia, to provide analysis and engineering services to implement a displaced left-turn intersection (DLT) at one of the busiest intersections in all of Fayette County. This $9 million construction project is anticipated to be completed in 2023. These state roadways are two of the most congested corridors in Fayette County and are over-capacity during peak conditions. The Stantec team was contracted to implement the most effective traffic solution, which was determined as a DLT. The firm’s DLT experts have consulted on numerous new DLT feasibility studies across the U.S., with a focused expertise in the Southeast, including the implementation of the first two-leg DLT in the country in Baton Rouge, Louisiana. For further information, visit www.stantec.com. This isn’t going to work. There’s too much traffic and not enough room for the cars. The solution, and only solution, is to limit the free-flow of cars traveling southbound on 74 from Tyrone. That free-turn needs a light so left turners on 74 N going onto 54 W do not get trapped in the box, and cars going through 54/74 on 54 W are not backed up. The right-turn light should *only be green* when 74 N/S is green. There’s just *way* too many cars flying into that little section of 54 W from 74 S without a limit and it is backing up traffic on 74 N and 54 W.
The reality is, more commuters need to stay on I-85 and get off at the Sharpsburg exit instead of trying to save 10 minutes going down 74 S and clogging up an intersection. There needs to be a deterrent. The 74 S-ers have clogged up the intersection for long enough by using it for commuting. The only other solution is to get rid of the light at the Avenue/Smokey Bones. It corrals too many cars between that light and the 54/74 intersection, causing the backups into the 54/75 box. At this point, 74 N-ers have started cutting through the Avenue to avoid turning left on 54/74 anyways and 74 S-ers ignore the “no pass through” signs on Marketplace Connector and form a huge backup all the way down to the Taco Mac during rush hour. The light is being used as a shortcut and is further redundant. The smartest option would have been to turn MacDuff into something the Tyrone to Coweta County folks could use to bypass 54/74 but we wanted more cute neighborhoods and built a two-lane road with a thousand speed bumps instead of another traffic corridor. Hindsight it 20/20. This video from VDOT does a great job of illustrating how the DLT would work. Interesting video from Va DOT, but, again, DLT lanes don’t work when there is so much traffic that the DLT can’t contain it all. In that case all that happens is that the jam is moved back beyond the DLT lane. The expense and YEARS of inconvenience that the project would generate would be wasted, just my less then humble opinion. The only solution is additional access routes from/to Coweta County that would take volume off of that intersection. Is a “bypass” from the Crabapple Lane area over to 34 somewhere between Fisher’s Crossing and Thomas Crossroads a possibility? We already know that any possible from a TDK to Christopher Rd or Hwy 54 is a lost opportunity. This is so tricky with the estimated 3,000 additional vehicles on the road in PTC once the new subdivisions along McDuff is completed. I fail to see how a decrease in time for left turns from Highway 54 in either direction helps the backups. My thoughts are to look back at another article explaining Jon Rorie’s announcement that “The CFI or something is coming in 2020,” Rorie told council members. It really is a wonder how the city can get anything done. The problem is not the 74 54 intersection. The problem is the stretch from the Avenue Light to the country line. It back up – so even when the light is green west bound traffic on 54 has no where to go. Making the intersection fancy will not unjam 54 west bound. Cars will just sit there at the green because there is no where to go. You could make it three lanes in each direction but likey the problem is the left turns an too many access points to the road. Fix the problem by increasing flow. Restrict access points on the problem strectch. Eliminate all left turns in both directions. On the stretch you can turn right – but not left. Come out of Walmart and Home depot and turn right, go down to the county line – and U turn. Too much work. No not really – because traffic will always flow nicely because of very much fewer red lights. 54/74 was a problem when I first moved to PTC in 97 and nothing that has been tried has improved the situation. Making 54 a four lane all the way to Thomas Crossroads was a big help. Some things have actually made it worse. Allowing so much development between 74 and Line Creek was a disaster that was forseen by many, but tax revenue speaks volumes. Adding more traffic lights and the hideous “through lane” going west from Planterra Ridge exacerbated an already horrendous problem. Nopw DOT is talking about another project that will affect everyone’s morning commute for….how long, years? and have little improvement in the long term. 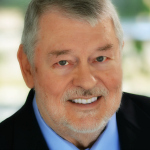 Many of us have seen the DLT approach as it’s used around Atlanta. They only work if the DLT lanes are long enough to hold all of the traffic trying to turn left. If they are not, all that happens is you wait to make your left turn in a different place than you did before. There is simply too much traffic and an alternate route that takes traffic off of the 54/74 intersection is the only solution. How many current residents remember when the gas lines were cut, not once but twice, during the 54 widening project near Duff Parkway? 54 was shut down and your choices for getting home were to drive up to Tyrone Palmetto Rd and come down an already overcrowded 74 or backtrack down to Raymond and Turin and come up through Senoia. Unfortunately, the best option for that was shot down years ago by politicians who envisioned themselves the smartest guy in the room and blocked it. I’m talking about the TDK extension over into Coweta County. The talk at the time was that nothing could be done with the area under the approach to Falcon Field. The park and recreation area that exists there now kind of shoots holes in that excuse. I’m sorry to say that, at this point, there is no solution. Traffic is simply too much for that intersection to handle and all attempts to improve it will be expensive painful band aids. Simply my less then humble opinion, thanks for letting me vent. Yea the universal opposition to the TDK extension baffles me – it seems the easiest solution that will make a real difference with the problem. This should be good. There are still some that can’t quite handle the traffic circle at Kroger. If it works, great.